Let’s face it, the MBM Aerocut G2 is pretty cool. If you are not familiar, it is the all-in-one Cutter, Creaser, Slitter. 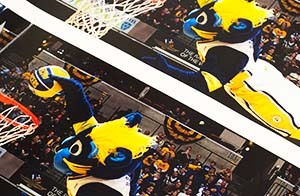 It can take your UV coated documents and cut them down, crease them, or slit them. 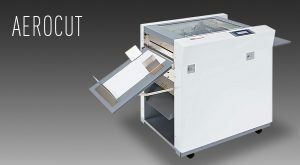 The G2 is perfect for a small print shop that wants to add the ability to provide finishing services to your customers. It can automate the process with multiple preset cuts that can process small jobs in a much shorter period of time than purchase a separate cutter, creaser or slitter. This is easy. Print a sheet of business card stock, put a stack onto your MBM Aerocut G2, select a preset cut design and press the button. The Aerocut will automatically feed and cut your business cards down to size based on the settings you select. It cuts the labor in half on your business card projects. You are a small print shop. A customer comes in and wants door hangers to target neighborhoods for their services. With the MBM Aerocut, you can offer the door hangers with no problem. Take your sheet of UV Coated door hangers and run it through the MBM Aerocut for it to be automatically done. 2 panel brochure? 3 panel brochure? 5 x 7 mailer? Multi-page brochure? No problem. The MBM Aerocut G2 can do it automatically without much human intervention except for selecting the right program to run your project. Once you have everything set up, it will create you brochure to your specification. One of your customers would like to create a custom greeting card using their own artwork. No problem, the Aerocut will cut and crease their new greeting cards to perfection. 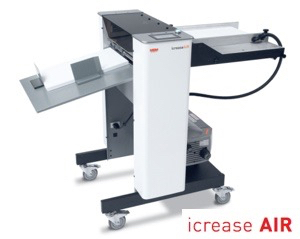 The MBM Aerocut G2 is the perfect machine for a small print shop. It’s versatility helps you offer multiple options for your customers to promote themselves. Being able to offer business cards, brochures, door hangers, greeting cards gives you the ability to meet your customers’ needs without outsourcing the finishing. Turn your print shop into a finishing machine.